This article by Vera Thoss, Lecturer in Chemistry, Bangor University was originally published on The Conversation. Read the original article. The appearance of vivid bluebell carpets in British woodlands is a sure and spectacular sign of spring. Bluebells – Hyacinthoides non-scripta (L.) Chouard ex Rothm – are Britain’s favourite wildflower and particularly fine carpets attract visitors to well-known sites such as Kew Gardens in London and Coed Cefn in Powys, Wales. 'This is our patch. 'Bluebells also form carpets without a wooded canopy – for example, on Skomer Island in Wales – and point to the locations of ancient forests, long after the trees themselves have vanished. This is because, unlike trees, bluebells have most of their biomass and reproductive organs (the bulb) below ground where they are better protected. They certainly are worth treasuring. 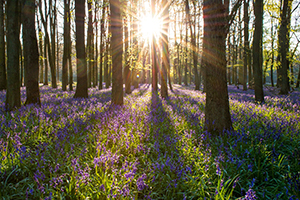 It is estimated that Britain is home to half the world’s population of bluebells. But they are now threatened by the introduction of the related Spanish bluebell, (Hyacinthoides hispanica), leading to hybridisation and loss of habitat. Once removed, it takes decades to establish a population of bluebells large enough to create the characteristic carpets. They are beautiful flowers, but have you ever wondered how bluebells pull off an even more impressive feat: being in their flowering prime when other plants have only just started to grow? Here are seven of their cleverest tricks. 1) The cold triggers growth: While most plants require a number of hours above a certain temperature before they start growing again, bluebells are dormant during the heat of the summer. Instead, their seeds are triggered to germinate when the temperature drops below 10°C, allowing them to get a vital head start and be in full bloom when spring finally arrives. 2) They dig deep: Bluebells have contractile roots, which pull the bulb deeper and deeper into the soil with every year of growth. This protects the bulb from frost, which starts from the soil surface, and temperature fluctuations, and provides better access to water in drought conditions. Cool customer: bluebells start growing when the temperature falls.3) They use fructans as reserve carbohydrates: While most plants use glucose and build starch or cellulose, bluebells predominantly convert sunlight into fructose, from which they build fructans. This adaptation allows them to photosynthesise at temperatures below 10°C. The plant’s large bulb comprises up to 70% fructans, which fuels their winter growth. Fructans also serve another purpose, minimising the formation of new cells and causing existing cells to elongate instead. This is an advantage because the plants can grow without biosynthesising all the material needed to make new cells. You can see the effects of this by looking at a bluebell’s leaves: at first, they are firm and upright, but gradually lose their rigidity as the cells elongate. 4) They spear through any obstacles: The leaves that emerge from the bulb are as close to each other as possible and shaped like a spear with a small, sharp tip. This allows them to find their way through any obstacle – both below and above ground. When the leaves start emerging in mid-winter, there tends to be a lot of dead leaf matter and other detritus lying on the forest floor. Having an arsenal of little spears is critical for punching your way through this into the sunlight. 5) They cooperate: Bluebells are known to cooperate with mycorrhiza – symbiotic fungi. The fungi obtains carbon from the bluebell in exchange for nutrients, particularly phosphorus. Both parties win, thanks to their use of a wood wide web. 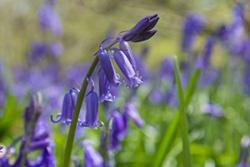 6) …and compete: Phosphorus is an important resource for plants – and bluebells “know” it. As well as securing their supply of it with the help of mycorrhiza, they also restrict the supply available to other plants. They do this by storing phosphorus in the form of phytate, which can only be converted into a usable form with specialised enzymes. so they take up more than they need thus depriving other plants? 7) They shape their surroundings: Bluebells engineer the soil and their environment to optimally support their own kind while making it harder for other species to grow. As well as storing phosphorus in the form of phytate, and using fructans instead of glucose-based polymers, they quite literally win the turf war by carpeting the space above ground.